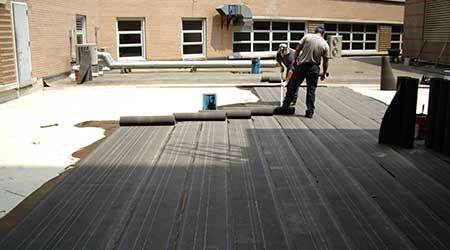 Facility managers can't be too hands-off with a roofing installation. After awarding the contract, be sure to check in frequently on the project to make sure all is well. After planning and project documents, the next step is to hire a contractor and oversee the installation. Here are four steps to getting that process right. • Are they an established business with a good reputation? Check references. • Do they have the financial strength and trained personnel to take on a project with the scope and size of the one being bid? • Do they have the necessary experience and manufacturer’s authorization to install the specified system? • Are they properly licensed and insured? Once all the project documents have been created and acceptable to the owner, a meeting should be scheduled at the project site a couple weeks before quotes are to be received. This will be the time for those quoting the project to have an opportunity to review the specification, take their own measurements, and ask questions. It is a good idea to make this meeting mandatory for those competing for the project award. Other considerations include the expected scope and duration of the project and how that will fit into business operations scheduling. Also, consider the weather requirements for the project; based on the expected start date, can the project be completed before the weather window closes? For example, if a building is located in a cold northern climate and the roof system will be installed using cold process liquid adhesives don’t wait until October or November to start the project. Even solvent-based adhesives and coatings require the ambient weather conditions to be dry with temperatures of 50 degrees F and rising for proper application. If awarded too late, cold weather could set in before the project is complete. The building may end up having to close down a partially completed reroofing project until spring. That is not a favorable situation to be in, since temporary tie offs can leave the facility susceptible to leaks and unfinished surfaces can become contaminated. Finally, when evaluating quotes, be wary of any that are extremely low. It is possible that quote incorporated an estimating or calculation error. If awarded, that contractor may look for extra add-ons or cut corners to make up the shortage in that quote. If the building owner partnered with a roof consultant, they should be scheduled for considerable observation time during tear-off and the installation process to verify that the specification is followed using the proper materials and application methods. The owner should receive routine written reports with photo documentation. Fulltime qualified third party observation is most desirable if the owner can budget for that service. The selected contractor will typically allow for an occasional weather delay in the projected schedule, but be sure that the project is watertight before they leave the site each day and that they return to the project as soon as weather permits. Provided thorough inspections were made prior to writing the specification and a mandatory prebid meeting was held, there should be no, or at least few, surprises during the installation phase. Occasionally a building owner might find more area of deck repair is needed that was allocated in the specification. But those types of potential unknowns are typically quoted in advance on a per square foot basis. Be sure there is provision within the specification outlining the change order process to document the request, its evaluation, and the cost effect on the project. Depending on the size of a reroofing project and the expected duration, the building owner will also need to provide for incremental payments during the project. The contractor will need to pay its employees and pay material suppliers for products delivered. To avoid any confusion, the terms of these payments should also be addressed in the specifications with a schedule of values of work to be performed and documented before partial payments are provided. The final payment should be retained until the owner is satisfied with the completed project and receives the executed warranties.